Multiple separate topics related to pool build questions have been merged by moderators. Some posts may appear to be out of order. Please keep all your build related questions on this thread. Thank you. Folks...I just joined today and want to say Im happy to be here. My first question is this...im about to purchase my first in ground pool and Im deciding between a 12x24 or a 14x28 in ground vinyl liner pool. My yard is a side yard (corner property) and the setback space that I have available to build in is approx 35x42 give or take a foot. 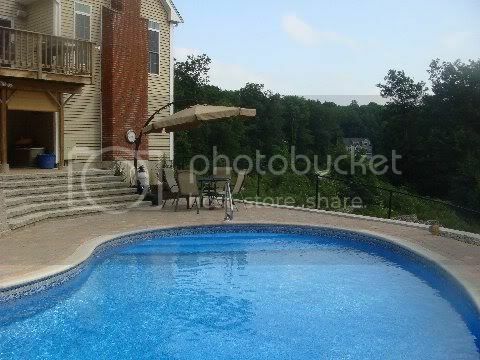 So I dont know if I want the pool to take up too much space because I do want some patio area. Altho, since my property is a corner property and the pool will go on the side yard, I also have some area on the other side of the house too. So back to my original question, I like everything about vinyl pools, price, look, feel, etc except for one thing...that ugly white plasticy-looking coping around the pool. It makes it look cheap. Actually, I also dont like the look of those white plasticy-looking steps either. It makes it look like some sort of orthopedic rehabilitation facility rather than construction addition and improvement to your house. With regards to this, are there aesthetic options that could be done to hide or replace these 2 concerns? Can I get stones or paving over that coping to simulate a gunite pool? If so, is it layed right over the vinyl coping?...how does that impact replacing and access to the coping if service is needed in the future? In regards to those hideous steps...what are my options? Thanks all for assisting a new member! Folks, Heres the actual quote I recieved for a build job for my in ground pool in North Bergen area of NJ. I think it's a little high AND Im curious as to why certain pieces of equipment were chosen. Since I havent much background in all the equiptment and specs, I am asking from some more experienced pool customers or installers just to spend a moment of their time to glance at it and possibly provide me with some feedback as to what I should either go back to the salesmen and request or change or clarify. 4000 P.S.I. Concrete Footing, Vermiculite-Cement-Fiber-Mesh Floor, 27 Mil Commercial Liner. Jets and Stainless Steel Safety Rail, Stainless Steel Ladder. Re: OPTIONS to improve look of that UGLY white Vinyl Coping?? Most Vinyl liner pool kits I've looked at offer a cantilever coping option so that the concrete, bricks, flagstone, etc... go right up to the edge of the pool, so no white bullnose coping to look at. I've seen some people have been able to find the steps in colors that match their liners, which is a huge improvement IMO. LOL....Jason, no offense...but those steps you linked me to are the exact steps I am looking to AVOID! If those are an improvement, I wonder the other ones looked like? Are those my only options for steps? thanks for your help...also, the link you sent me for the cantilever coping was helpful, do you have any real world images I could see of it in place on a pool? Call around, get 5-6 estimates and then ask for references and call them too! Guarantees are only as good as the builder...so a 28 day completion guarantee is great, but what recourse do you have if it takes longer...is it free? Good luck with the build...the pump/filter combo seems spot on...that about where my expertise falls off. Look at my pool. I have cantilever coping made out of stone. And..I thought those white fiberglass steps look bad too. I went with steps inside the pool. The liner covers the steps and is solid blue so you can differentiate the steps from the pool bottom. Thats not a bad price for the east coast. I have a similar set up. 2 skimmers might be overkill for that pool, but for the price, let him do it. I have the same heat pump; I like mine. He might be about 3-4k high. That rectangle is a lot cheaper than the kidney i have and mine was a couple thousand cheaper AND i have automation and a SWG. Then again, he's including a locking safety cover (what kind?). Thats worth around 2k including install right there. I'd ditch the ionizer, you dont need it. Think about a SWG as well. Overall, he might be ~4k too high. But then again it's jersey so i'm not sure. In Massachusetts, that's in the ballpark. Thanks for the feedback...Im not good at haggling, what is the BEST thing for me to say to him to try and get him to lower the quote AND include the items you mentioned SWG in place of ionizer?......etc? No the 3 ft patio is not standard, at least around here. Ask him about the price, SWG, etc. There no magic to it, just talk to him. One thing not mentioned in the quote is a fence. is your yard already fenced? guys, thanks for all the assistance.....In regards to a Heat Pump vs a Gas Heater comparing installation prices, quality and performance, which would you recommend in the NJ area. I am not getting a jacuzzi or spa, ....just a pool. Also, if I step down from a 14x28 to a 12x24.....what pricing should I negotiate to leverage down that original quote? thanks for all your help again! Does having a stone cantilever coping OVER the edge like that create any problems when and if servicing the liner needs to be done? Does having the liner OVER the steps create any additional puncture, air bubbles, or other risks?? Heat pump hands down. I'll comment on the other stuff later. One more thing, you may want to get him to quote you an upgrade to a 2 speed pump, it can pay for itself on saved electricity for most people. I also say ditch the ionizer. ...and replace it with what? Also what should be the cost difference? Folks....How can I get this price down and still add these options you guys are recommending? What are some key things to say to try to have him lower my quote? Sand is fine. There are cartridge people and DE people too, and they will tell you what they have is best. But, for ease of use and no hassle, sand is fine. Again, the ionizer is not worth the money and really is not needed. Substitute that for salt watewr chlorine generator and the automation that goes with it. A pentair IC-40 with an Easytouch 8 automations system is worth about $1200. Just substitute it for the ionizer, straight up. I'm not that gung ho on 2 speed pumps. They can save electricity a bit, but then again, my 3/4 HP single speed runs 13 hours a day and it olnty adds about 35-40 a month on the bill. You have to look at your electric rates to see if it makes sense. For that size pool, i'd just do a 3/4 HP super pump instead of the 1 HP. Thats plenty for a 14x28 pool. As for the deck, i dunno. 3 feet around isnt that big. You want a bigger deck than that. Plus, i'm not big on putting in a deck right after the pool is done. The fill needs to settle some before a deck is done. IMO, ditch the deck and have another contractor do it later. 1) does that price include electrical work to hook up the pump, heat pump, etc. for that price he quoted, it should. 2) what kind of material is he going to use for backfill? I'm sure i'll think of more. As far as negotiation, cant help you there really too much. You have to decide of you really want the ionizer or SWG. Do you want the deck he's offering, or get your own guy. a 14x28 shouldnt be more than 15-16k. That doesnt include all the other stuff, thats just the pool. Mine was 22k for the pool. The heat pump, lights, electrical work, salt water and auotmation system, good backfill, the whole nine yards was around 30k. That didnt include a deck or mesh loop loc cover, either, so like i said, he's in the ballpark. I would get another estimate too. 5-6 estimates is overkill, IMO. All the vinyl builders are going to be close, really, they couldnt compete otherwise. I think it's waaaay too high. I just sent you a PM. Not for his area it's not . Prices for this kind of thing vary a lot depending where you live. Prices for pools in the northeast are more than they are in the south, period. Thats a decent ball park price for where Fudgebar lives. There are other options and where you live doesn't matter. I've sent him a PM.